This holiday was great. I liked the hotel cleanliness as soon as i saw the hotel i thought uur yuck when i got in my apartment it was sparkling clean! !We were self catering so we had to go out for food. The bar down stairs Bennies bar was great!If there reading thisd id like to say hello an tht i miss them all!The food was great an down the road was a place called The Dropp inn it was amazing an cheap but then again Bennies bar was lush an cheap!I recommend it to you! The hotel locastion is good!The hotel staff were great espacially the one who got chucked in the pool!The entertainment was class i will never ever forget it! Especially the hypmotist an Jay n Gordy!It was GREAT!! !I only wouldnt go to this hotel again becausde i saw other nice ones like vacanza acroos the road from it so i probaly would go back again! the cleanliness was poor,maids only cleared dirty towels and bedding once a week,never cleaned bathroom.apartments were not swept before we arrived.nightporter was not very friendly or helpful.the dining area had to get fumigated due to the uncleanliness of the area.no air/con which madeit difficult to sleep as well as noise from other apartments and nothing got done about it. Stopped in this hotel june 2003,great location, good place to eat just down road Yorkshire pride 2 . The hill isnt that bad my kids walked down it every day and back up it and didnt moan once 10,8,6, entertainment bit poor karaoke till about 12 every night as well as bingo mainly. only one lift and we was next to it kept us a wake some nights as well as some noise outside didnt bother kids but at the end of the two weeks was glad of a good nights kip. recommend to take a pillow only one each and they were flat. Set ur alarm for the sunbeds if you wasnt out for 9.55 ready and waiting ur too late. The pool could of done of been a bit bigger for the size of the hotel,supermarket straight across the road which was handy. The walk to the beach was quite a nice walk . Apart from that not a bad holiday for a reasonable price. The apartments were very roomy, they were clean on arrival but you don't see any maids and they only change to towels and bed linen once a week. The entertainment was not very good and you have to travel down a very large hill to get to the resort centre. Not good for elderly or disabled, but a taxi back cost only a few euro. There is not adequate pool area or sunbeds for the amount of rooms and if you weren't up early (10am) to get a bed you had no chance all day. Quite noisy at night although there are security on reception. They take a 60 euro deposit and check all itmes on the intinery before returning this at the end of your holiday. I would go back again to these apartments but only as a last resort. Cleanliness was fine had no complaints... On our first week we got clean towels and sheets at least every other day. By the second week our all night antics took there toll and we were sleeping into mid afternoon, so the maids couldn’t tidy up, but all we had to do was go to reception to get some fresh towels anyway so it was no biggie. If I remember correctly we only ate a few times from "Bennies Bar" we had a breakfast and a few burgers which filled a gap. But not to sound mean there were other places with bigger menus. But they did make the best bacon and chicken French stick roll I have ever tasted it took two of us to eat it was that big! And it got washed down nicely with one of there alcoholic slush puppies. No complaints about the location from us. I can understand elderly people having problems, if they choose to walk down the hill. But if you walk the opposite direction you can walk down a little road which is not so steep, we discovered this after falling on our bums trying to walk down the hill in heels. The hotel is about 15 minutes from the square and it’s so easy to find you couldn’t get lost if you tried. The Staff were great had no problems, they had rules and as long as you didn’t break them you had no problems, a big rule was walking in bare feet, they didn’t like that, my friend would often get in trouble for that. The staff were polite they would call taxi's for you, and always said Hola no matter what time of day you were strolling in at, there was always someone on the desk. Entertainment. Ummm well I'm sure it's someone cup of tea but not ours. It was a laugh though and I suppose its better then nothing. Most evenings we wouldn’t go out until about 11 so we would sit on the balcony drinking the cheap WKD's and Breezers from the supermarket across the road and sing along with the man and his missus, it was funny and put us in the mood for a good night so I guess in retrospect they were pretty good. I would definitely visit this hotel again I had a wicked time, it was clean, it had a mix of young and old people which was good. We only stayed at the Cadiz for 3 days due to being moved from our previous apartments which we had spent a fantastic 1 1/2 weeks. On arrival our rooms weren't ready and we all had to wait in the reception area for around 2 hours. The rooms were very big but filthy dirty,the floor did not look as if it had been swept or mopped for weeks. The kitchen cupboard doors were hanging off and there was a funny damp sort of smell in the room. The pool area was tiny for the amount of rooms in the hotel, and not once did we make it up early enough to get a sunbed. The food in the tiny little restuarant was very basic but was cheap. The location of the place wasn't all that bad up a bit of a hill. when arriving to the hotel we all paid a deposit, but when we went to claim the deposit back they refused us all (all 4 rooms) saying that one room had a hole kicked in a cupboard door,the other had lost a key,and other 2 had reasons too, so they made alot of money out of us. I enjoyed this holiday it was brill. There were lots of things to do and lots of places to go. The entertainment was great. The night life was situated not that far away approx 300m and the beach 800m. I would definitely recommend this holiday to everyone. I enjoyed me stay and will come back in the near future. Well, what can I say? The reports of this hotel are totally unfounded! Not once did I hear the alledged "obscene" music, not once did I have a complaint about the maids or the cleanliness of the rooms, and not once did I have a complaint about the lifts or the location of the Hotel. The hotel management are very efficient, and any requests are carried out immediately. Below the hotel is a cafe bar called Bennies, run by a wonderful couple called Don and Maggie. Nothing is too much trouble for them. The food is very good and reasonably priced, and so are the drinks. The bar staff are very polite too.The BBQ is excellent value for money, well worth trying out. 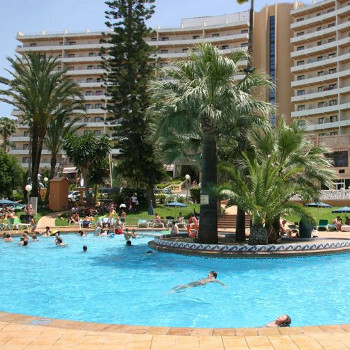 The whole atmosphere was of a family atmosphere, the hotel being located 10 mins from the beach, the epicentre of Benidorm and Aqualandia/Mundomar (which is a must to see, "Swimming with dolphins" at Mundomar is fantastic). Also Locally is a fantastic family run bar/carvery, called the Kings Arms. It is owned and run by a couple called Nigel and Claire. This is located close to the beach. They offer fantastic food at reasonable prices. Look out for their theme nights, one of them being a curry night, not to be missed! They also own "The old Vic" which is located more centrally, if you would prefer a good, reasonably priced drink in the centre of town. I would DEFINATELY recommend the cadiz to anyone wanting a good, reasonably priced holiday in benidorm! I stayed at the Cadiz in August 2002.The location is not ideal if you dont like to walk up and down hills to get to the main centre. The rooms are very basic and were not cleaned by the maid, we only had linen changed once a week. The most anoying thing is that we had to get up every morning at 8.00am to get a sunbed (there are only 30 sunbeds for all the appartments) The music in the snack bar was sometimes offensive we had to ask to change the cd many times. We had a good holiday overall but would not stay at the Cadiz or go self catering again.